ItemB-07909 - Group At First Mission Exposition. ItemB-07910 - The first school at Mission. ItemB-07921 - "Dominion Day parade, 1912, Prince Rupert, BC"
ItemB-07923 - "Reception of Sir Richard McBride at Prince Rupert"; "Prince Rupert Welcomes the Honourable Sir Richard McBride and Honourable W.J. Bowser"
ItemB-07926 - "Knoxville Prince Rupert; showing grading operations." ItemB-07927 - "Prince Rupert townsite"
ItemB-07928 - "7th and 8th Avenues, Prince Rupert, BC." ItemB-07929 - "Prince Rupert Waterfront." ItemB-09423 - James Bay Athletic Association rugby team, and their managers, Victoria. Item B-07926 - "Knoxville Prince Rupert; showing grading operations." 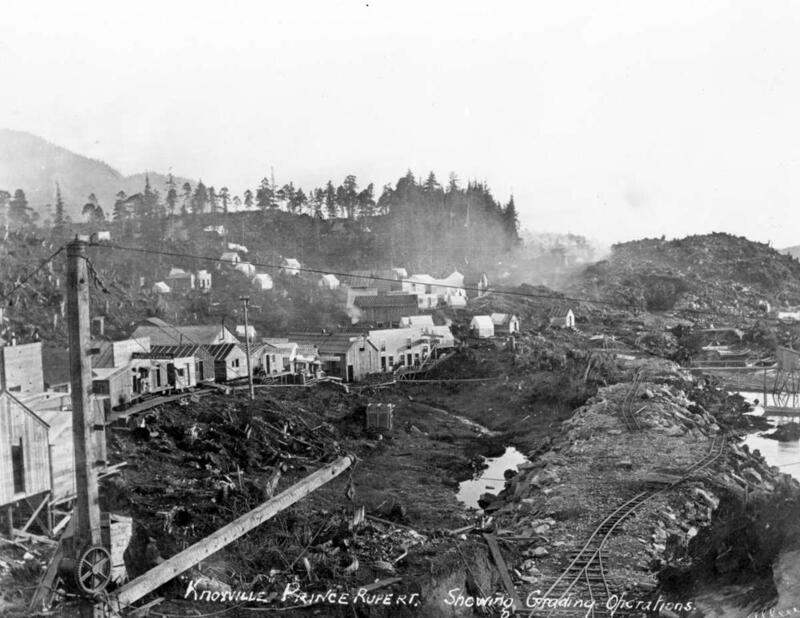 "Knoxville Prince Rupert; showing grading operations."